Let me start off by confirming that I am a noob when it comes to home brewing as this is only my sixth batch of beer. I used DME (dried malt extract) for all of my beers, but I do plan on switching to all grain come 2011. I just want to make sure I am making good beer with the extract and understand the process before making the switch over. This beer marked the first time that I made a yeast starter. nike cortez I actually built it up twice over the course of a five day period. The process was fairly easy – easier than I thought. Just boil up 16 ounces of water and a cup of DME to make a 1.040 gravity wort. Cool. Add to your fermentation vessel, pitch the yeast, ready to go. This will increase the amount of viable yeast. 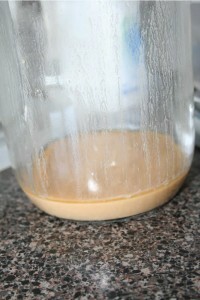 Yeast starter for the beer. This had been built up twice and I didn't use a stir plate. Why did I create the starter? Double Bogey has an OG (original gravity) of 1.110 and yeast that you purchase for home brewing is only good to an OG of 1.060. If you pitch the yeast without the starter there is a good chance the yeast won’t be able to handle all the sugars, making this situation actually detrimental to their health. The brew day, as usual, took four hours. 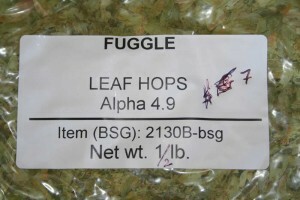 The best purchase for this batch: a half-pound of whole leaf Fuggle hops. I didn’t need it all but Fred, the owner of the local shop, offered the eight ounces for $7.00. Yes, you read that right – seven bucks. I usually pay $3.00/ounce of hops there. How could I pass it up? Since the recipe for Double Bogey only called for two ounces of Fuggle hops, I now have six ounces left in which to make some new recipes. 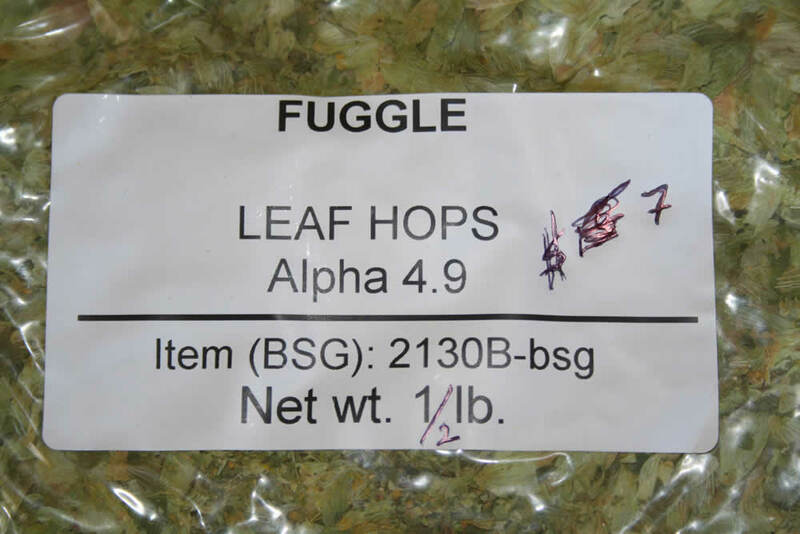 The idea that popped into my head was to make an IPA with Fuggles in each part of the hop profile: bitter, flavor, aroma – adding to both the boil and dry hop along with some Amarilla. I have to pound out the idea a little more in my head and of course roll the idea around on message boards for some more input. The beer also had one ounce of Norther Brewer at 60 minutes and two ounces of Kent Goldings at 10 minutes. The Fuggle was added with one minute left in the boil. The Norther Brewer was an experience though. 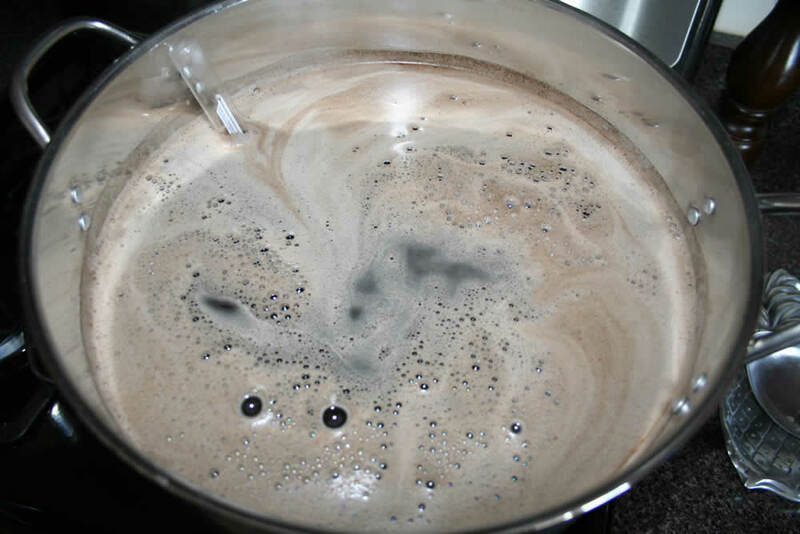 From the steeping of the grains, the addition of 64 ounces of water pre-boil and seven pounds of DME, the brew pot was quite full of liquid. I added the one ounce of hops shortly after the boil began. In the time that I turned to place the wrapper on the counter and come back to the beer…BOOOM…the word almost exploded out of the pot. Luckily none got on me. Just the stove top and sides and the floor. What to do? I was worried that the boil sugars landing on the stove top would ruin the paint enamel, thus upsetting the wife. That was really the only major concern I had. I put the pot on the other side of the stove. Let the wort cool on the other side and cleaned the stove before my wife woke from her nap. How you like that?! Yes, I did tell her about the incident. Four pounds of grains were held steady at 154 degrees for 30 minutes during the steep. The rest of the brew day went off without a hitch. I do have a concern about the boil over. I did lose a lot of hops from the Northern Brewer addition as they had yet to fully get bogged down into the wort. The sides of the kettle and the stove seemed to be covered in a lot of hop material. This lends me to think that the bitterness will be no where close to were it needs to be. This beer has a ton of sugars from the DME and steeped grains that need to be offset by a large hop profile otherwise the beer could be too sweet. Unfortunately this beer will take a could three to five months for it to develop into its prime. A long time to wait to see if the boil over created a really bad balance towards the sweet side in the beer. No matter, I think this is a good recipe and if it isn’t what I expected, I will brew it again in another year or two and compare. Next Up: an IPA with or without the Fuggle. The wheat beer I made for my wife, per her request, is coming around nicely. I don’t think that will last too long, so that might be after the IPA. Sometime soon I want to sneak in a Hefe. Enjoy! 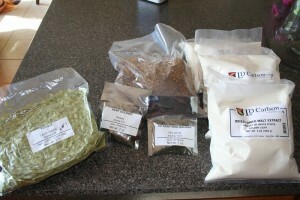 This entry was posted on Sunday, March 7th, 2010 at 11:46 am	and is filed under Home Brewing. You can follow any responses to this entry through the RSS 2.0 feed. Both comments and pings are currently closed.